Dingle Marina Cottages are comfortable self catering holiday homes offering accommodation in the picturesque town of Dingle, Co. Kerry, Ireland. 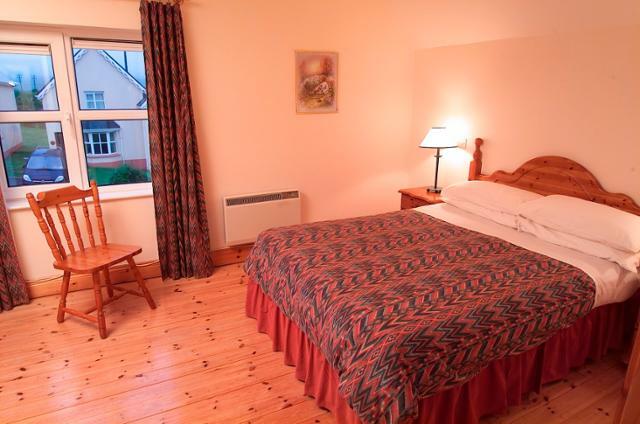 The location is ideal, overlooking the beautiful harbour and just a 2 minute walk from Dingle Town. Ideal for a quite relaxing family holiday or a lively week in the thriving and vibrant town of Dingle. The cottages are designed with comfort in mind in a traditional Irish style. The fully fitted kitchen features an oven/hob, washer/dryer, microwave, dishwasher, fridge and all important utensils and crockery. The spacious pine living room includes multi channel T.V, direct dial telephone and open plan dining area. Each cottage has three bedrooms that sleep five people. One double, one twin and one single. The double bedroom has a private bathroom/shower ensuite. The one twin bedroom and one single bedroom each have a separate bathroom upstairs and downstairs. All bed linen and towels are provided for each cottage.The Cottages are heated with electrical central heating with storage heaters/convectors in each room. Use of the Dingle Skellig Hotel Leisure Club & Pool is available for a weekly membership of €150 per cottage, per week. Children have access to the Fungi Kids Club at the Dingle Skellig Hotel. Charge of E5.00 per child per visit applies. To book these cottages please contact the office on 061335799.